A cooling, refining and deep-cleaning Kaolin and Bentonite clay masque that purifies, absorbs excess surface oil and helps prevent future breakouts. Niacinamide, Zinc Gluconate, Yeast Extract, Caffeine and Biotin purify and inhibit overactive sebaceous gland activity while soothing irritation. Salicylic Acid clears congested follicles to minimize development of future comedones and breakouts, while Spiraea and Cinnamon Bark extracts inhibit the growth of acnegenic bacteria while stimulating the skins natural antimicrobial agents for clearer, healthier skin. Contains no artificial fragrance or color. * Salicylic Acid exfoliates dead skin cells and clears congested follicles to minimize development of future comedones and breakouts. 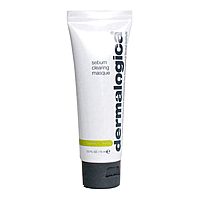 * Kaolin and Bentonite clays absorb excess oil. * Spiraea Ulmaria Extract inhibits bacteria by stimulating the skins natural anti-bacterial agents. * Niacinamide, Yeast Extract, Horse Chestnut, Licorice, Panthenol (Pro-Vitamin B5) and Caffeine regulate sebum production and soothe inflammation. * Zinc Gluconate and Caffeine help regulate sebum production and help control bacterial metabolism of sebum-reducing inflammation. * A patent-pending Cinnamon Bark blend inhibits bacterial lipid metabolism and degradation of enzymes while eliminating bacteria and providing astringent properties. * Oat Kernel, Bisabolol and Licorice help soothe irritated skin. * Farnesyl and Panthenol (Pro-Vitamin B5) strengthen follicle membrane.